NVIDIA Home > Support Home Page > Knowledgebase Home Page > How do I adjust convergence in my game? 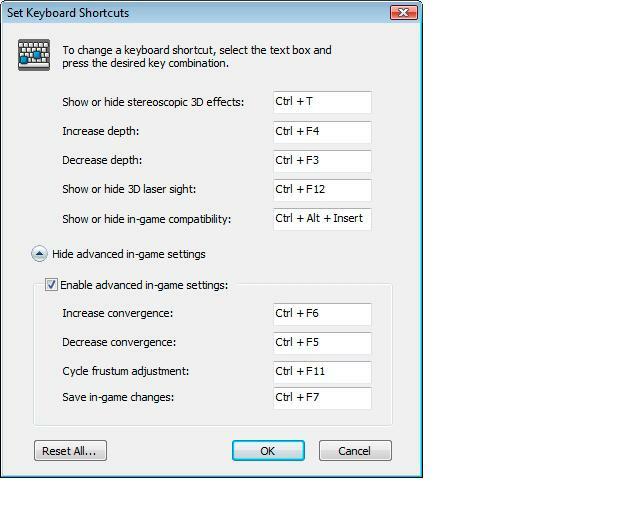 First, browse to the NVIDIA Control Panel > Stereoscopic 3D > Set up stereoscopic 3D control panel and press the button “Set Keyboard Shortcuts”. On that page, press the down arrow to Show advanced in-game settings and click the checkbox “Enable advanced in-game settings” and select your hotkeys. Alternatively, you can use the 3D Vision USB IR Emitter to adjust convergence by holding down the On/Off button and then adjusting the depth wheel on the back of the emitter. NOTE: Make sure the hotkeys you have selected do not conflict with any in-game controls.